Under the Food Safety Modernization Act (FSMA), the federal Food and Drug Administration has recently published two rules concerning the nutrition facts panel on foods and the supplement facts panel on dietary supplements. These changes reflect the concerns which led to the passage of the FSMA; that is, creating a more knowledgeable food consumer. These new rules update FDA Rules and Guidance documents previously finalized after the passage of the Nutrition Labeling and Education Act (NLEA) and its amendments. The original goal of both the NLEA and the underlying rules was to standardize food labels. That goal has been expanded under these two new FSMA rules to not only keep labels standardized but also to provide additional nutrition information to the food buying consumer. In finalizing these new rules, the FDA has inserted its comments that are attached to the new rule. The agency notes that the changes to the nutrition facts panel are intended to give the consumer sufficient information about the contents of the product to allow the consumer to make educated decisions regarding the food they buy and consume. The two new rules are designed to address two main goals: first, update the content and format of the nutrition facts panel, and second, updating the Reference Amounts Customarily Consumed (“RACCs”) and creating the new “Dual-Column” label. “Calories from fat” has been removed, as modern scientific understanding of human health and metabolism have shown that the amount of fat consumed is less important than the type of fat consumed. This is why trans fats have been banned from foods in the US. “Added Sugars” and “Total Sugars” have replaced the existing sugar content disclosure. Similar to fat content, modern understanding of how sugars impact our diets and health has shown that added sugars are more harmful than the naturally occurring, less processed sugars in our food. The vitamin and mineral disclosure requirements have changed. The FDA, through national research results, has found that the average American consumer obtains sufficient amounts of certain vitamins and minerals through an average diet such that disclosing these amounts on food labels is not useful for consumers. As a result, Vitamins A and C, which had previously been mandatory, are now not required, but still permitted. Instead, Vitamin D and potassium are now required, which are less likely to be found in sufficient quantities in the average American diet. 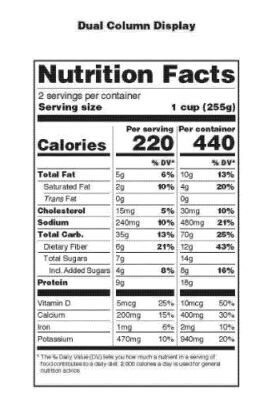 Updating certain reference values used in the declaration of percent Daily Value’s of nutrients on the Nutrition Facts and Supplement Facts panels. The font for “Calories” has been increased and is in bold in order to draw more attention to this disclosure to reflect the relative importance of this value. 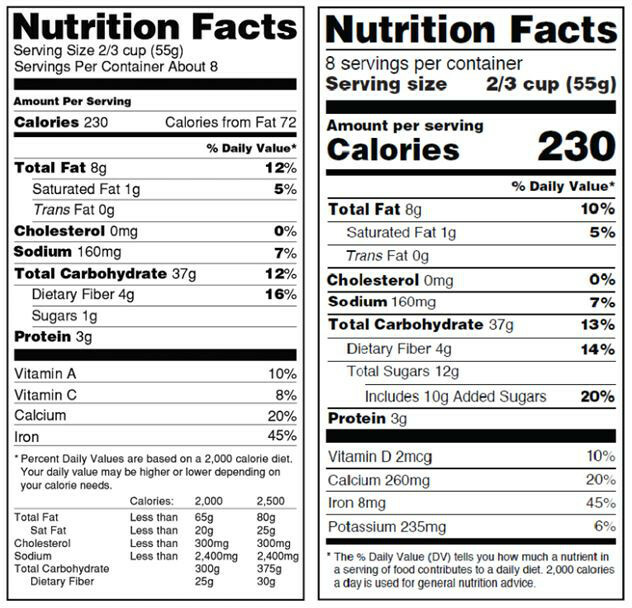 RACCs and the new Dual-Column labels are based in a better understanding of the interaction between container size, serving size and the average American diet. Essentially, the FDA raised concerns that a container size can cause consumers to consume an entire package of food even when it contains more than one serving. In order to better reflect this reality, and better educate the consumer as to the nutrient contents of the food they consume in a single sitting, the FDA has revisited the RACCs of some foods, and now requires the use of dual column labels where a consumer is most likely to consume the entire container at a single sitting. RACCs were created in 1993, and were based on national food consumption surveys conducted in the 1970’s and 80’s by the US Department of Agriculture (USDA). These studied allowed the FDA to establish a database of foods and the amounts that Americans were regularly consuming at a sitting at the time. Since then, the FDA and USDA have continued to survey American food consumption and have found that the assumptions and data that supported the RACCs, no longer apply, or have changed significantly. Using data from the 2003-2008 National Health and Nutrition Examination Surveys, the FDA updated the RACCs where the survey showed that consumption had increased or decreased by 25 percent compared to the 1993 values. An important consideration for the food industry is the impact these label requirements will have on package shape and size. These labeling changes are likely to require label redesign that is compliant with the new rules and possible even a package redesign to allow for the redesign of the nutrition panel. Many stylized containers have limited space for labeling, and with the increased label space demanded by the new nutrition facts panels, some companies will be required to re-design not only their labels, but their containers as well. Since a great deal of a food products marketing campaign is built around the appearance of the product and what it contains, these rules will not only affect the packaging/labelling of a given product but will have an impact on the marketing of the food product more than likely. These two new Rules were both slated to go into effect on July 26, 2016, but each has a required compliance date of July 26, 2018. Businesses with less than $10 million in annual food sales have a longer compliance date of July 26, 2019. However, leading up to July 2018, the FDA will be launching a series of public outreach and education initiatives both online and in public media that are aimed at educating the consumer regarding the new labels. This increase in public awareness of the new labels will therefore grow as these compliance dates are realized. As a result, members of the industry are encouraged to begin transitioning to the new labels as soon as possible, particularly for those companies that will need to re-engineer their packaging as well as their labels. At Thompson Coburn, we have a team of food industry attorneys that routinely counsel food companies on compliance with the new FDA rules promulgated under FSMA, the impact of new food marketing claims on the FTC’s regulations and how to reconcile the two federal agencies requirements in a commercial environment. Our attorneys would be happy to answer any questions the food industry may have about these new requirements, their deadlines, and additional FDA/FTC compliance issues. Diane Romza-Kutz is a partner in Thompson Coburn's Health Law Practice Group.